I get many E-mails from readers who are confused about stocks and flows. At least that is my diagnosis because from the questions that I get asked it is apparent that there is a deep misunderstanding of what a budget deficit actually is and how it is different from the stock of outstanding public debt. This is an important issue and bears on how many seek to comprehend the latest Eurostat – Flash National Accounts data – for the third quarter 2012. The data is now signalling a further descent into recession in the Eurozone and with further cutbacks being imposed on various nations, already mired in what should be called Depression, the outlook for 2013 is worse. This is a case of governments deliberately undermining their economies. The strategies in place cannot work. All they will do is add more workers to the millions that have already been forced into unemployment by this policy folly. I view the policies being imposed in Europe and the UK, for example, as criminal acts. The latest Eurostat estimates came out last Thursday (November 15, 2012) and confirm that not only is the Eurozone mired in a deep recession again but that the collapsing demand that started in the weakest, so-called peripheral EA17 nations is now spreading to the core EA17 economies – the powerhouse economies of Europe. That was always going to happen under current policy settings and it amazes me when I read headlines that economists are surprised by what is happening. In a short-time from now, the IMF will issue some weak-kneed update declaring they have revised all their growth estimates down, again. Ever to be wrong. And, as I have noted previously, all forecasts come with standard error bands because of the nature of the exercise. Those in the know understand that. But the IMF produces systematic errors – which mean they do not arise from the stochastic nature of the underlying forecasting process. These systematic mistakes are sourced by their ideological biases, which, in turn, shape the way they create their economic models. If the underlying models (with all the in-built assumptions etc) are plain wrong, then the output that is generated from them will be, in most cases, wrong. No surprise about that. GDP fell by 0.1% in the euro area1 (EA17) … during the third quarter of 2012, compared with the previous quarter … In the second quarter of 2012, growth rates were -0.2% … Compared with the same quarter of the previous year, seasonally adjusted GDP fell by 0.6% in the euro area … in the third quarter of 2012, after -0.4% … in the previous quarter. 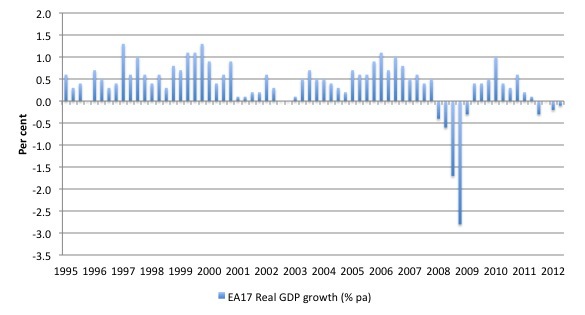 The following graph taken from the Eurostat Quarterly National Accounts data shows the annual growth in real GDP from the June quarter 1995 (earliest available data) to the third-quarter 2012 (September). The double-dip recession pattern that is now emerging is familiar to nations that withdraw fiscal support too early. Like most nations/regions, Europe experienced a very deep recession in 2008 and into 2009 but the combined spending stimulus that came from the deficits both within Europe and beyond (China, USA, UK) provided the path out of the downturn. All the talk about having to solve the debt crisis and the rest of it would have been largely moot had the ECB acted early and supported the deficits, which were driving a growth renewal. Even without a “federal” fiscal capacity, the Eurozone could have recovered relatively quickly, if the ECB had not joined forces with the EU and the IMF to derail the resurgence. Once the neo-liberal idealogues moved in and demanded austerity there was only one way in which the economies of Europe could go. And … they have gone there and it is getting worse. The next graph decomposes the real GDP growth down to the member states (only those who did not have published flash estimates for September 2012 are excluded – Luxembourg, Malta, Slovenia). 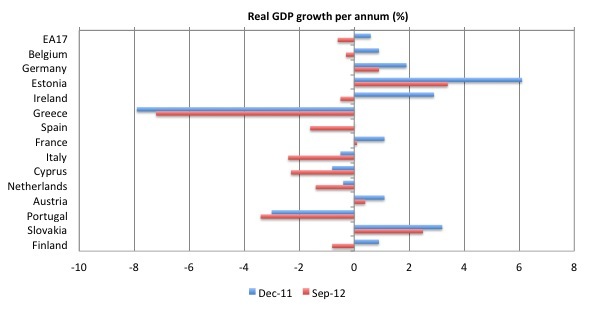 The blue columns represent real GDP growth in the December-quarter 2011 while the red columns show the most recent flash estimates for September 2012, which will almost certainly be revised in the full release in the coming weeks. I expect the revisions to show an even worse picture to that already depicted in the graph. The point to note is that now the double-dip recession is clear – there has been negative growth in 3 of the last quarters at the EA17 level and the non-negative quarter (March 2012) recorded zero growth – the impact is spreading to the “growth engines” of Europe (France, Germany, Netherlands). Even the fast growing Estonia has been hit with the slow-down and its trend is down. I think the official data is now allowing us to gloss over the catastrophe that is happening in the Southern European states where unemployment is now rising beyond 25 per cent and youth unemployment is more than twice that rate. Per capita living standards continue to plunge and soon, for many states, they will be poorer than before they entered the Eurozone, with no relief in sight. In fact, some of the nations (Greece, Spain, Ireland, Portugal, maybe Italy, perhaps soon France and the Netherlands) will face years of hardship and declining living standards. The fact that both Greece and Spain have agreed (or their elites have agreed) to further spending cuts as a result of on-going coercion from the Troika (EU, ECB, and the IMF) means that their economies will definitely deteriorate further in 2013. It is certain that Greece would not be in this position if it had have stayed out of the Eurozone. It might have experienced a recession in 2008, like most nations, but its capacity to use its own currency and its depreciating exchange rate would have allowed it to return to relatively robust growth soon after. Its experience with Euro membership is a catastrophe and it is now mired in a Depression rather than a recession. The message from the latest data though is that these catastrophes are heading north – to Austria, the Netherlands – both nations that have been sheltered by Germany’s on-going (but now slowing) growth. Both these nations contracted in the September-quarter 2012. It really highlights how poorly developed the policy agenda is – and don’t forget it is a policy agenda that is forcing millions of people out of work and into poverty. Even more will lose substantial if not all their accumulated wealth as a consequence of this policy folly. And recall the infamous Chapter 3 of the World Econmomic Outlook Update – published by the IMF in October 2010. It was entitled – Will It Hurt? Macroeconomic Effects of Fiscal Consolidation – and used estimates drawn from simulations of the IMF’s Global Integrated Monetary and Fiscal Model (GIMF) to tell nations that fiscal consolidation would inflict short-term damage of a relatively modest variety. The estimated rise in net exports they predicted would “soften the contractionary impact” and fiscal consolidation had to be based on spending cuts rather than tax hikes because if the latter used the IMF told us that the consolidation would be “more painful”. The IMF also said that there was “truth” in the ” “expansionary fiscal contractions hypothesis” because the cuts in government deficits would stimulate private sector business and household confidence, which would allow that sector to pick up the spending gaps left by the government withdrawals. A fiscal consolidation equal to 1 percent of GDP typically reduces GDP by about 0.5 percent within two years and raises the unemployment rate by about 0.3 percentage point. All this stuff was wheeled out by conservatives and those in charge on economic policy to justify their vandalism. As a country-by-country case study would tell us these forecasts are not even remotely correctly. And then we learned in early October that the IMF had made a big mistake. They “discovered” that that their policy advice, which has caused millions to become unemployed and nations to shed income and wealth in great proportions and all the rest of the austerity detritus, was based on errors in estimating the value of the expenditure multiplier. The 1 per cent equals 0.5 per cent is null and void. They now admit the expenditure multipliers may be up to around 1.7, which means that for every dollar of government spending, the economy produces $1.70 of national income. Under their previous estimates of the multiplier, a dollar of government spending would translate into only 50 cents national income (a bad outcome). The renewed awareness from the arch-austerity merchants that they were wrong and that fiscal policy is, in fact, highly effective, means that the “fiscal consolidation” that they have been bullying nations to impose (successfully) will be highly damaging. It means that the continued obsession not only with fiscal austerity but also with discussions surrounding monetary policy have been based on false premises. There have been many articles over the last few years expressing surprise that the vast monetary policy changes have had little effect. But as soon as the writers note this they launch into the standard arguments about inflation risk and the rest of the narratives that accompany discussions about central banks. Soon we will have to accept the fact that monetary policy is not a suitable tool to stabilise aggregate demand at appropriate levels. We will also have to acknowledge that the only way out of the crisis is via renewed fiscal stimulus. Please read my blog – So who is going to answer for their culpability? – for a detailed account of the IMFs latest “discovery” and what it means. So far no senior IMF official has been dismissed for overseeing this incompetency. Nothing exemplifies the folly than what has been going on across the English Channel. In the June 2010 Budget, we learned of the austerity plans of the new Tory government in Britain. Its Treasury “think tank”, the Office for Budget Responsibility published the forecasts for real GDP – GDP at market prices and General Government consumption and investment – June 2010 Budget forecast. 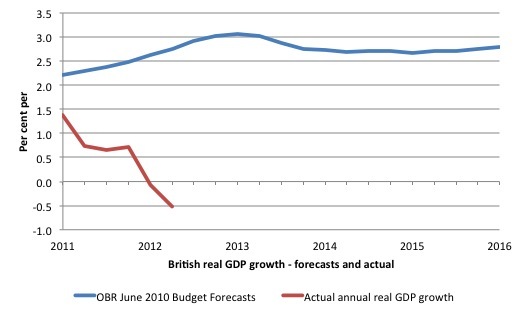 The logic of the austerity drive was based on the modelling that produced these forecasts. At the time I argued (along with many) that these forecasts were unattainable and were a pipe-dream or a cooked up lie to massage the political landscape so that the conservatives could get back to decimating the social welfare system in the UK. The following graph shows the reality against the framework used by the British government in 2010. The read line is that actual annual growth rate of real GDP in Britain as published by the Office of National Statistics. And of-course, the ratings agencies are all part of this absurdity. Remember back to 2010 in the afterglow of the June 2010 British budget. Moody’s applauded the fiscal austerity being imposed by the British government. Recently they threatened to downgrade the British governments credit rating because the economy has tanked badly. As if butter wouldn’t melt in their mouths, they stand up before us repeating this rot month after month as if we haven’t got any memory retention left. Didn’t they know that the austerity was going to drive the British economy down the red path? Did they really believe the nonsense that the OBR was trying to represent as the course of the British economy under the policies that the Cameron government was about to introduce? How could they be so stupid? The answer is that they are not stupid but then they are also not in the business of seriously appraising the economic trajectory of a nation. The credit rating agencies are money making machines who will lie, bribe, cheat and dissemble when they need to to improve their bottom line – and they act in that way without regard for the people they damage along the way. The evidence that the US Congress enquiry elicited a few years ago proves the dishonesty of the ratings agencies beyond doubt. How come none of the senior officials in those organisations have remained out of prison given the way they behaved? Which brings me back to the introduction and the confusion I note in E-mails I receive about the nature of deficits and public debt. The most elementary thing that we have to understand before we can progress and comprehend why fiscal austerity is so damaging is the difference between a stock and a flow. Fiscal consolidation attacks flows of spending not stocks of debt. The aim is to generate primary budget surpluses which will then allow the government to reduce the stock of debt over time. A budget deficit is the net outcome of two broad flows (denominated in the currency that the national government issues) – revenue and spending. What do we mean by a flow? Many economic graduates fail to differentiate between a stock and a flow. A flow is a variable that is measured per unit of time. So a certain number of dollars being spending per week, month, quarter. If a government was spending $A10 million per day then after a week they would have spent $A70 million and so on. You add flows together to get a lower frequency aggregate (a week is a lower time frequency than a day). Once a flow has occurred it has gone. It has consequences but a flow is not “paid back”. Alternatively, a stock is a variable that is measured at a point in time. So a dollar amount at the end of 2010. If there are 1 million people unemployed in January, 2 million in February and 3 million in March – these are stock measures. To get a measure of unemployment in the first quarter of that year (January-March) we would average the individual stock observations to get a value of 2 million. A stock is a legacy. Flows create stocks and a well-grounded macroeconomic framework has to be stock-flow consistent. Please read my blog – Stock-flow consistent macro models – for more discussion on this point. So job hires (the number of workers entering a job per period) and quits (the number of workers leaving a job per period) lead to stock measures of employment and unemployment (once we know what the labour force is). Similarly, depending on specific arrangements in place, a rising budget deficit (the net sum of the revenue and spending flows) can add to the stock of outstanding public debt (a stock) if the government insists of issuing debt $-for-$ to match the net public spending (the deficit). If the government didn’t have these arrangements in place then there would be no particular relationship between deficits and outstanding public debt. Commentators get hopelessly confused when discussing the economic consequences of the flows (deficits) and the stock (outstanding debt). But when we are thinking about deficits we should ignore the stock associations. From the perspective of Modern Monetary Theory (MMT) the debt implications are an entirely separate discussion which should not be conducted at the same time as we seek to analyse the consequences of the flows. When you read a politician say that “prices will rise because of money being spent by the government flowing into the market” if the central bank bought treasury debt, you should ask two questions: (a) Does that mean that all spending is inflationary? and (b) What difference does the issuance of debt to private bond holders make relative to no private debt placement? 1. Yes, deficits are inflationary – which isn’t an answer to the question asked and tells you that the person doesn’t understand the point. 2. Central banks buying debt is just printing money and so there will be “too much money chasing too few goods” and that will be inflationary. But if you issue debt you soak up that private spending capacity and replace it with public spending and that is less inflationary. If you think about that within the flawed logic you might wonder whether government spending would add anything to demand. A mainstream economist however will approach the matter in a more analytical manner. In this blog – How are the laboratory rats going? – I wrote about the government budget constraint literature (GBC). 1. Mainstream economists claim (lie) that the government has to “finance” its spending just like a household. The government is just like a household but bigger from the perspective of a mainstream economist – a super-household. So they then move onto analysing the “financing” choices of government and integrate these options in their analysis of the consequences of government spending. 2. They identify three sources of finance: (a) Tax revenue; (b) Public debt issuance; and (c) A change in high powered money. They argue that Option (c) will be inflationary and so deficits, inasmuch as they exist should be funded by Option (b). 3. They claim Option (b) is also damaging – via financial crowding out (pushing up interest rates) and so the government should run at worst a balanced budget but also bias policy towards low tax-rate regimes (because they claim taxation undermines saving and growth). 4. In analysing the degree of expansion afforded to a nation from these “funding options”, the mainstream economists claim that the degree of expansion is greater with the third option relative to Option (b), which, in turn, is more expansionary than no deficit at all. Modern Monetary Theory (MMT) disputes those claims. Monetary expansion is considered most expansionary because the mainstream economists claim that the central bank controls the money supply – because there is a money multiplier operating that links changes in the monetary base (ΔH) to changes in the broader money supply. They claim that interest rates are determined by the private demand for money relative to the supply of money and under usual conditions when the government expands high powered money, interest rates fall which stimulates private spending in addition to the government spending. They compare that with debt-issuance which they say leaves the money supply unchanged and so the only monetary effects are an increasing interest rate (via the government spending pushing up interest rates) which chokes off private spending. This is the crowding out effect. The public spending crowds out private spending. The extent to which this happens is debated at length (this is what mainstream academics write endlessly about) with moderate mainstreamers allowing government spending to be expansionary but less so than the monetary expansion because of the crowding out effects. The extreme mainstream economists believe the crowding out is 100 per cent. Ricardian Equivalence is a version of that extreme view. The mainstreamers then say that as high powered monetary creation is the most expansionary it should be eschewed because it will be inflationary. They invoke the Quantity Theory of Money here – which claims there is a direct and proportional relationship between monetary growth and inflation. They forget to remind everyone that the result could only hold if there is full employment (and some other assumptions that also rarely hold). The problem is that the myth has become part of the folklore that we operate in and so you even hear progressives mouthing that concern (as noted above in the Japan example). As an aside, by recognising that central banks can directly facilitate government spending without recourse to the private debt markets the mainstream are really admitting there is no financial constraint on government spending. That is why they are so vociferous about inflation. 1. Central banks cannot control the money supply. Please read my blog – Understanding central bank operations – for more discussion on this point. 3. Expanding high powered money does not cause inflation. Please read the following blogs – Building bank reserves will not expand credit and Building bank reserves is not inflationary – for further discussion. 4. The central bank sets the interest rate – please read my blog – Will we really pay higher interest rates? – for more discussion on this point. 5. Increased government spending does not put upward pressure on interest rates – please read my blog – Will we really pay higher interest rates? – for more discussion on this point. 6. The national government does not have a financial constraint and the monetary operations that might be associated with government spending does not alter the impact of that spending. The government spends the same way irrespective of these operations. It credits bank accounts (or indirectly credits them by issuing cheques). This spending adds to aggregate demand and boosts employment and output – as long as their is increased capacity. The reality might be that the treasury may instruct the central bank to credit some bank accounts and some intra-government accounting record would be altered. The accounting is of no interest to us economists in this context. Alternatively, the treasury might instruct some other government agency to put out a bond tender to match the spending increase. The spending still occurs in the same way and then the accounting for the debt issuance is a bit different (as we will see) but of no significant to that spending. The mainstream claim that high-powered money creation (depicted as the government asking the central bank to buy treasury bonds which the central bank in return then prints money) means that the extra spending will cause accelerating inflation because there will be “too much money chasing too few goods”. But in fact the economies will respond to aggregate spending increases by expanding output unless they cannot do that. When might that be? At full employment. In which case, why would a government continue to expand nominal spending if they know they cannot tease any more output (and employment) out of the real economy? Most economies are typically constrained by deficient demand (defined as demand below the full employment level) and so nominal demand increases (growth in spending) will not lead to inflation. So when governments are expanding deficits to offset a collapse in private spending, there is plenty of spare capacity available to ensure output rather than inflation increases. You will also appreciate that the inflation risk comes from the spending – not what accounting gymnastics are performed – that is, whether the government “borrows from itself” (exchanges of accounting information between treasury and the central bank) or borrows from the public (swapping a bank reserve for a bond account). So these monetary operations (high powered money creation/debt issuance) neither increase or decrease the risk of inflation associated with the spending. What matters is whether there is spare capacity in the economy to increase production when a spending increase enters the economy. If there is then the inflation risk is low to non-existent. If there isn’t, then the inflation risk is high – bond issuance or not! I suggest you read the suite of blogs – Deficit spending 101 – Part 1 – Deficit spending 101 – Part 2 – Deficit spending 101 – Part 3 – as background to this blog. Also, please read my blog – Budget deficit basics – for more discussion on this point. The point is that real GDP is driven by flows of expenditure. Spending equals income. At present, in most nations, the private sector is not prepared to return to pre-crisis spending growth, given that they are deleveraging (mostly) to produce more secure balance sheets after the credit binge leading up to the collapse. Export growth will not provide the salvation because to have export growth in one nation other nations have to be willing to expand import spending. With private spending, in general slack, that is not going to happen. So there is a very large flow of non-government spending that was happening that is now not happening. That means that the real GDP will fall unless there is a replacement for that non-government spending. That replacement flow has to come from government. It has to run whatever size deficits are required to maintain the flow of nominal aggregate demand at levels that will engender and sustain economic growth. That is why fiscal austerity is undermining – and was always going to undermine – economic growth and sustain the crisis. As real GDP declines and unemployment rises, the conservativism of non-government spending agents, which caused the crisis in the first place, just gets worse. How? The problem is excessive private debt and the population needs additional money to pay it. Deficit spending by the monetary sovereign provides that additional money. So how can reduced deficit spending increase household and thus business confidence? It can’t. Instead it should reduce confidence. Not only are governments not sovereign in Europe but they must sell any yield bearing assets which means they must increase taxes even further to gain revenue. I think last year even RATB (Paris Metro , tram etc) was interested in picking off our public transport system. Surely it is logical for the Paris Metro to concentrate on Paris and Dublin Bus to deal with Dublin ? no ? Yes ? what ? Not sure what the situation is now but I am sure more vultures are gliding down to the rotten meat. A french based company already controls our tram system so I guess that involves the further export of hard currency to some treasure island somewhere , so therefore we must export to it to get any currency back – creating more hidden Externalities and waste not easily quantified by accountancy. Madness squared but it has a serious objective. This is a extreme form of Manchester economics where domestic monopolies sometimes badly run but who must work within the current domestic political system are pushed out by hidden external monopolies who farm these now plantation economies pushing them into physical surplus so that this surplus can be directed towards the big house. So therefore these are nothing like national hinterlands trading with other national hinterlands – these are mere vassals of global corporate power. I am afraid central banks and treasuries owned by banks enable this process as Central bankers are well bankers who help farm the money supply for their little banking sisters and have no concern for asset quality or improving asset quality as they have the legal right to farm the value hidden within Government fiat. So you get a general rundown of assets as the capital is sweated out of the system via debt management. This is why we are seeing massive capital rundown today. Richie Boucher of BoI was very frank about this recently. CIE is sure to fail now – that is the plan you see. This is what happens when a goverment cannot print money tokens. Modern Irish energy policy 2012…….. It best to print greenbacks that the banking system cannot farm , but now the domestic system cannot even devalue against other banking fiefdoms. These policies are to direct massive capital export out of the country to other banking fiefdoms such as their current Golden children in Germany and Poland. They do this as these countries can run down their capital base more efficiently but no new net capital is created as this would harm profits. The banks are in fact sweating out the debt value of all assets even if it means dark age entropy. You get “respected” economists carted out every Sunday explaining this is a dull as ditch water depression. “It was also a peculiarly old-fashioned bank bust, based essentially on lending money to people unable to pay it back. But that is clearly not the case. I am afraid MMT will not really deal with the problem of private banks which issue credit in the goverments unit of account. The 19th century free banking crisis was not civilisation destroying existential events as I believe this is and even back then free banking would have had very little impact if non banking controlled goverments issued a high ratio of greenbacks (and taxed highly) relative to private bank notes. The Note is as good as the bond. Note that Bill believes that banking should be nationalised along with other utilities. This would deal with most of the very legitimate issues you raise. I think that at the very least banks should be regulated to within an inch of their lives. The UK labour party is talking about running the railways on a not-for-profit basis. It would be an improvement if the banks were to be run the same way. It would be more stock-flow consistant for the mainstream to say “too much spending chasing to few goods and services”. The stock of “money” being irrelevant to price inflation. It would be more stock-flow consistant for the mainstream to say “too much spending chasing too little production of goods and services”. The stock of “money” being irrelevant to price inflation. I don’t think that is the MMT position although Bill can fill in the blanks – I think MMT is more about reducing their leverage power somehow with the use of deficits. I tend to agree that you cannot stop private credit creation , but you can easily stop them using sov government units of account. Anyhow the 19th century free banks would not have been as powerful if the governments issued more greenbacks and taxed the stuff. We occupy a strange world now – people outside social systems in corporate seats of power hold vast claims on a now rump & very pathetic economy. The CBs actions via QE etc was obviously trying to make these claims more sustainable – it has no real interest in the underlying physical economy. Its interest is in sustaining the present now very weird social structure which has formed as a result of total private control of the commons and in the sustainability of tribute. It is not unlike the medieval Church in that regard. A sort of transnational gue or belief system with the corporate sector now at very high altitude , in the stratosphere really. It is a very strange world now , not unlike past times I guess. I try to imagine medieval Europe as a place where 3 tectonic plates meet. 1.You had the first cross tribal border corporate entity or multinational , the Catholic church. You can see how these cultural forces meet when you enter this church grounds. I don’t believe the system will survive must past another decade – the simple fiat /tax greenback idea divorced from banking will most likely only see the light on the other side of this coming dark age if at all. I say the beginnings of total breakdown of social structures soon. I hope I am wrong but I don’t think so. When you read a politician say that “prices will rise because of money being spent by the government flowing into the market” if the central bank bought treasury debt, you should ask two questions: (a) Does that mean that all spending is inflationary? I’d expect them to answer yes – in fact I’ll go further and say they have a point – it’s just that they don’t realise how many decimal places they are to the right of it! 2. Central banks buying debt is just printing money and so there will be “too much money chasing too few goods” and that will be inflationary. But if you issue debt you soak up that private spending capacity and replace it with public spending and that is less inflationary. …which shows that they think spending capacity is inflationary. You’ve shown their reasoning to be completely wrong, but could there be some other way that it’s less inflationary? For instance, could it result in more private borrowing from overseas boosting the currency value? for me the political question remains why Europe (with the US about to fall in line) follows austerity even though the arguments directed against it are so plain and strong. I simply don’t believe that the austerity fondamentalists are just a bunch of stupid people (even though this impression often imposes itself). I rather imagine that – underneath the ideological level – there lie financial interests of the rent seeking part of society that are directed against full-blown economic growth and full-employment. Myths like the inaffordability of deficits or the necessity of debt ceilings or “debt-breakes” don’t materialize out of thin air but are a clear means of keeping governement and the real economy in check. Of course this might be a good thing in itself if you have identified the government as the source of all evil. But isn’t there a positive reason to keep the economy in constant crisis in the form of financial interest ? Saw a documentary (“the secret of Oz” availible through youtube) where they explained the historical antagonism between the private bankíng system and the government in the US as to who would control the money supply. The more the private banks supplied money the more it earned interest even from the government. The american bank association in order to put pressure on the governement at the end of the 19th century went so far as to condense the money supply in order to strangle the real economy. So what I’m trying to understand is the financial interest behind austerity. Still interest ? A perfect example of pointless trade that runs down countries core internal wealth & capital bases. This is not a rational trade pattern – China is at the other side of the world for God sake. This is trade to pay off private malinvested debt. It looks as if the EU works for China now or at least wants to follow their unique communist yellow brick road. This is the Ireland Inc phenomenon. After 1986 / 1987 in Ireland and indeed Spain rational internal commerce was shut down as the banking credit began to build up , it was crudely hidden by this credit hyperinflation but it was there for all with eyes to see. Now that these cultures and economies have been irradiated they can continue on with their experiment. There also can be no doubt that there is a deeper and wider political agenda of turning these former nations which once held a certain level of internal redundancy into purely commercial spokes of the truly devilish euro market state agenda. They Neutron bomb both cultures and economies and then rebuild them (if they can) into their own dark image. Who is mounting this market state war ? Surely there must be generals planning and executing this total economic war ? As this sort of stuff does not happen by accident. The same topic is being discussed on the NEP site today – but with an emphasis on what is wrong with our cadre of “progressive” economists – Reich, Krugman, Baker et. al. Why are they unable to admit that economics as a science has been sold off to Wall Street in return for academic status and plain old sweetheart deals – things like “speaker’s fees”? These progressives’ hearts are clearly in the right place. And they are certainly smart enough – MMT really isn’t that hard to fathom once we try. So why won’t they try? I suppose Krugman’s own explanation is the most likely – they fear that they will lose what little traction they have in the policy debate if they fail to toe some version of the mainstream line on debt-to-GDP. So, even if he’s right, he’s wrong. Would-be progressive economists were the very first supporters Obama discarded in 2008. Now Robert Kuttner is up on Huff Po agitating for Ben Bernanke to replace Tim Geithner at Treasury – because he is the person-of-influence most likely to understand the dire effects of austerity. To this are our brand-name progressives now reduced. As for the blog – great, as usual. Thanks, Bill. Sometimes you have to hang the required policies on the coat tails of something else that captures the public anger. Bernanke? Just when you think he will say something useful about fiscal policy he turns around and warns about debt, unsustainability, and all the usual neoliberal mantras. Spare me. Hi Bill, I understand your argument regarding the difference between nations that issue their own currency and nations that don’t. I’m just wondering what your thoughts are how the States (the Australian federation that is) should fund their infrastructure development and services. Should this type of thing be placed entirely in the hands of the Commonwealth or do we just tinker with the GST, so that the States have enough money? Reason I ask is that there are calls for the GST to be increased and I’m wondering if this is really the way to go. On the contrary, it’s an example of the useful trade that is beginning to compensate for the pointlessly run down capital base and will eventually increase its internal wealth. Firstly it’s New Zealand, not China, that’s on the other side of the world from Spain. Secondly it’s a very rational trade pattern. China exports lots of stuff to Europe, so it would be silly to send all those containers back empty. Spain manufactures something that Chinese consumers want to buy. The money they pay for it is worth less to the Chinese than the cars (hence they’re worth buying) but more to the Spanish than the labour, materials and energy needed to produce them (hence they’re worth selling). At the macro level, maybe – but that’s better than failing to pay it off or selling productive assets to pay it off. And at the micro level, it’s nothing to do with malinvested debt – it’s simply taking advantage of an opportunity that everyone benefits from. The conclusion that there are no local customers is truly strange – how did you reach it? Considering how much better run the Chinese economy is to that of Europe, that looks like wishful thinking!